Step by step, the Gillard Government is becoming more and more like the UMNO Government in Malaysia. The issue now is control over media. Never mind what Senator Conroy said the inquiry is about – it is about shutting down criticism over the Gillard Government. See this interview with Bob Brown, PM of Australia – at least he can be credited with honesty in this case. He said it is about controlling the Murdoch Press. I dont like the Murdoch press myself – things like The Sun paper in the UK may be a lot of fun when you are young or drunk (or both) but it is appalling in all other respects. The way they (News of the World and Murdoch Press) go about getting leads and breaching privacy of the most vulnerable, is really disgraceful. There is no reason however, to think what happened in the UK is also a problem for Australia. The only problem with the press in Australia is with Julia Gillard and Bob Brown, the Prime Minister of Australia. They dont want criticism. They want to shut down or control their critics. That is very Malaysian. 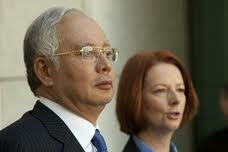 Gillard and Najib Razak are looking more and more alike every day. Global Warming and the Carbon Tax … Nuts. Want to know what a recent expert study on climate change says? See the following excerpts, and you’d think the whole thing is uncertain enough to avoid implementing the carbon tax scheme, but then again we’re dealing with Gaia land maniacs here. The study was a follow-up on a previous one, addressing some feedback and criticisms on its previous approach. It’s a serious, normal scientific endeavour, which shows if nothing else, climate change is a an issue on which the jury is still well and truly out. Given this uncertainty, why is the Gillard Government and her mob especially Bob Brown, Christine Milne and the Greens in general so hell bent on wrecking our economy, especially since even if the science is a settled issue, what Australia does in addressing emission will ever only have a totally negligible effect? Whatever Australia does, if it does it alone, will not change anything one bit. In a way, this Labor Government is very similar to the UMNO government in Malaysia. Sick. 9 July has come and gone. Tress and I were with close to a thousand others at the Federation Square on Saturday afternoon, for a rally to demand some electoral reforms in Malaysia. We went with Brian, a good mate of mine who in turn introduced us to another bloke, who was also a lot of fun. The BERSIH rally in Melbourne was no where near as eventful as the KL version, but the KL folks showed the BN government it needs to take a serious look at itself or it is going to be sitting at the opposition side of the house come the next election. At the very least, BERSIH 2.0 has stripped BN off whatever claim to legitimacy it has left. Najib Razak can barely stand with any credibility and he has his mob has come out of this looking really rubbish. Well done BERSIH, well done, Ambiga. On the domestic front, Bob Brown, Christine Milne and their mob have flexed their muscles and Julia Gillard continues to look worse by the day. All the compensatory aspects of the scheme may sit well for now for a group of voters but how will employment and foreign investment be affected over time? I don’t think Julia Gillard will be able to make the sale to the people in that regard. I think for most Australians, compensation is only a small part of it. What we want is assurance that jobs and investments and growths of these will not be adversely impacted, especially given the minimal impact the carbon tax will have on climate change. Ziggy Switkowski was once the head honcho of Telstra. It was before the days of the Sol Trojullio – the “Mexican” who came to reign Telstra in a tumultuous period and carted away a tidy pot of gold for himself. Ziggy has just written a piece in the Business Spectator about how futile the Australia’s attempt to reduce emission can be, when our contribution to the problem is miniscule. He has of course written in a much more convincing manner, setting out the economic and technological aspects of the issue and how green house gas emissions is really an economic and technological problem for now, not quite yet an environmental one. So for the Bob Brown and Christine Milne and the Greens to push this agenda and for Julia Gillard to be capitulating to their interest so easily appears a bit out of whack. That was the approach taken by the Howard Government – the economic angle – and it is now the defence piece of useless rhetoric for people like Wayne Swan in attempting to defend the carbon tax. What a shameless manipulation of facts. But then again these – other than Ziggy – are all politicians, they do that for a living. Ziggy’e piece is hot fresh off the oven – google it.